"As many of you already know, my wife Kelli has had epilepsy since childhood. The idea for the Adolescent Epilepsy Center at UCLA developed from the stories and struggles I have seen and heard from Kelli, my many patients, their families and others with epilepsy I have met throughout my career. Most of my training was on the East Coast. I received my Bachelor of Arts Degree in Psychology from The College of New Jersey, my MD from Rutgers Medical School and completed a Pediatrics Residency at Penn State, Hershey Medical Center in Pennsylvania. I also completed a Pediatric Neurology Residency at Albert Einstein College of Medicine, Bronx New York as well as a Pediatric Clinical Neurophysiology Fellowship at UCLA. After graduation I accepted a faculty position at UCLA and have been here ever since. 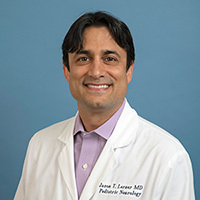 During my tenure at UCLA I have had a variety of leadership positions, including: Pediatric Neurology Residency Director, Pediatric Neurophysiology Lab Director, Associate Clinical Chief of Pediatric Neurology and finally Director of the Adolescent Epilepsy Center at UCLA. My research interests include: epilepsy in the adolescent population, seizures after traumatic brain injury and concussion and clinical neurophysiology." Salamon N, Kung J, Shaw S, Koo J, Koh S, Wu JY, Lerner JT, Sankar R, Shields WD, Engel Jr J, Fried I, Miyata H, Yong WH, Vinters HV, Mathern GW. FDG-PET/MRI Co-registration improves detection of cortical dysplasia in epilepsy patients. Neurology 2008;71(20):1594-601. Evans E, Koh S, Lerner JT, Sankar R, Garg M. Accuracy of amplitude integrated EEG in a neonatal cohort. Arch Dis Child Fetal Neonatal Ed. 2010;95:F169-73. Wu JY, Sankar R, Lerner JT, Matsumoto JH, Vinters HV, Mathern GW. Removing interictal fast ripples on electrocorticography linked with seizure freedom in children. Neurology 2010;75(19):1686-94. Abend NS, Arndt DH, Carpenter JL, Chapman KE, Cornett KM, Gallentine WB, Giza CC, Goldstein JL, Hahn CD, Lerner JT, Loddenkemper T, Matsumoto JH, McBain K, Nash KB, Payne E, Sanchez SM, Sanchez Fernandez I, Shults J, Williams K, Yang K, Dlugos DJ. Electrographic seizures in pediatric ICU patients: cohort study of the risk factors and mortality. Neurology 2013;81(4):383-391. Sanchez SM, Arndt DH, Carpenter JL, Chapman KE, Cornett KM, Dlugos DJ, Gallentine WB, Giza CC, Goldstetin JL, Hahn CD, Lerner JT, Loddenkemper T, Matsumoto JH, McBain K, Nash KB, Payne E, Sanchez Fernandez I, Shultz J, Williams K, Yang A, Abend NS. Electroencephalography monitoring in critically ill children: current practice and implications for future study design. Epilepsia, 2013;54(8):1419-1427. Arndt DH*, Lerner JT*, Matsumoto J, Madikians A, Yudovin S, Valino H, McArthur DL, Wu JY, Leung M, Buxey F, Szeliga C, Van Hirtum-Das M, Sankar R, Brooks-Kayal A, Giza CC. Subclinical early post traumatic seizures detected by continuous EEG monitoring in a consecutive pediatric cohort. Epilepsia, 2013;54(10):1780-8. Sánchez Fernández I, Abend NS, Arndt DH, Carpenter JL, Chapman KE, Cornett KM, Dlugos DJ, Gallentine WB, Giza CC, Goldstein JL, Hahn CD, Lerner JT, Matsumoto JH, McBain K, Nash KB, Payne E, Sánchez SM, Williams K, Loddenkemper T. Electrographic seizures after convulsive status epilepticus in children and young adults: a retrospective multicenter study. Journal of Pediatrics, 2014;164(2):339-46. Hussain SA, Shinnar S, Kwong G, Lerner JT, Matsumoto JH, Wu JY, Shields WD, Sankar R. Treatment of infantile spasms with very high dose prednisolone before high dose adrenocorticotropic hormone. Epilepsia, 2014;55(1):103-7. UCLA neurologist to start center to streamline epilepsy treatment.